One of the aims of this blog, especially more so since it has grown in the past few years, is to highlight the opportunities available to both bioarchaeology researchers and the public alike. As a previous post highlighted, never has there been a better time to be involved with bioarchaeological research and never has it been so open before to members of the public to engage with it (for instance, try your hand here or check out some resources here!). The communication of the aims, and the importance of the discipline, in the aid of understanding past populations and their lifestyles is of vital interest if we are to remain a dynamic and responsive field. As such it gives me great pleasure to announce that, starting from now, I’ll be helping to disseminate the results of the Show Us Your Research! (SUYR!) project spearheaded by researchers at the University of Coimbra and the University of Algarve in Portugal. The SUYR! logo. Image credit courtesy of GEEvH at the Universidade de Coimbra. The SUYR! 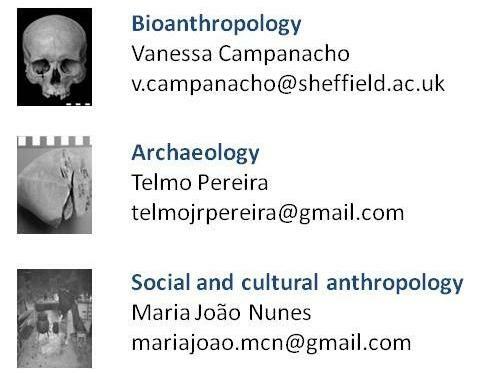 project aims to promote the projects that archaeologists and anthropologists have been involved in by diminishing the gap between the researchers and the public by regular concise publications aimed at the public (Campanacho et al. 2015). The project is aimed at researchers from the anthropological and archaeological fields from around the globe and accepts entries on methodologies, artefacts, theories, site studies and pathological studies, amongst other topics. To me this is a really exciting opportunity for early career archaeologists and anthropologists and one that I am thrilled to disseminate the results of. It is hoped that the project expands into interviews with researchers as well! The latest entry in the series focuses on malignant tumours (or neoplasms) in the palaeopathology record. The entry, submitted by researcher Carina Marques who is based at the Research Centre for Anthropology and Heath (CIAS) at the University of Coimbra, focuses on the skeletal evidence for malignant tumours in archaeological populations by investigating prevalence and typology of their presence. Cancer, as the World Health Organisation figures testify, is a major cause of human mortality internationally; however their neoplastic natural history, physical manifestation and evolution remains something of a ‘challenging endeavor’ (Marques 2015). As such Marques has studied and analysed Portuguese reference collections of numerous skeletal remains dating from the 19th to 20th centuries to try to identity and catalog neoplasms in the aim to ask how precise the pathological diagnosis of malignant tumours are in fairly modern skeletal remains. The research highlighted that the skeletal manifestations of tumours can vary and that they can present similarly to other pathological processes which can be hard to identify down to a single process. However, the research also documented that malignant tumours often left their mark on bone, particularly metastases (after the cancer had spread from one area of the body to another). The research has helped produce a body of data that characterizes neoplastic prevalence in these populations, providing an important historical context for the evolution of neoplasms. Furthermore Marques (2015) has also helped clinicians identify and characterize the early lesions that can often be missed on radiological examination. Subjects of interest in the SUYR! project and the contact details to send the research to. Image credit courtesy of the Universdade de Coimbra. If you are a blogger, a microblogger (ie a Twitter user), or merely want to share your interest in the fields of archaeology and anthropology to your family and friends, then you too can join in spreading word about SUYR! Simply copy and paste the website and share with your circle of family and friends. The articles are freely available from the main SUYR! site. If you are a college or university student who is interested in highlighting the various projects discussed via the project then perhaps you could even print out the pages and put them up on the community noticeboard in your department. If you are an active researcher within the above fields then why not consider sending in your own past or current research? This is a great opportunity to highlight the knowledge, breadth and depth, of archaeological research and the value of bioarchaeological research to the public. The archives of the SUYR! project can be found here for 2014 and here for 2015 years. Both of the years papers detail some really interesting projects going on in the anthropology fields, particularly in bioarchaeology. For example, Dr Charlotte Henderson kicks off the 2014 papers with an exciting and enlightening piece on the ability, and problems, of osteologists to infer occupation from skeletal remains. Later on in the year Victoria Beauchamp and Nicola Thorpe investigate the work of The Workers’ Education Association (WEA) in England and assess the impact of using heritage as a teaching aid. Both papers can be downloaded for free here. In 2015 Dave Errickson (a friend and a previous guest blogger on this site) has an entry on his work digitizing forensic evidence using 3D scans and laser scanning. The site itself is available to translate into a number of languages by simply clicking the scroll down box on the right hand side. The Grupo de Estudos em Evolucao Humana (Group of Studies in Human Evolution), at the University of Coimbra, have a website highlighting the ongoing initiatives, activities and projects by the members of the group. This includes hosting conferences, workshops and open days on any number of evolutionary topics. You can find out more information here. Campanacho, V., Pereira, T. & Nunes, M.J. 2015. Show Us Your Research! An Anthropological and Archaeological Publication for the Greater Public. Palaeopathology Newsletter. 170: 26. Marques, C. 2015. A Palaeopathological Approach to Neoplasms: Skeletal Evidence from the Portuguese Identified Osteological Collections. Show Us Your Research! 2015, No. 4. (Open Access). Tags: Bioarchaeology, Education Outreach, Forensic Anthropology, Human Osteology, Show Us Your Research! The University of Sheffield is playing host to a day-long workshop on the Coimbra method of scoring enthesophytes on the Wednesday 28th of January 2014. It is a first come first served basis as attendance (at £10 and £5 concessions) is limited, though there are still some places available – you can find out more information and book here. Dr Charlotte Henderson from the University of Coimbra, is one of the developers of the Coimbra method of recording enthesophytes in human skeletal remains and will be helping to lead the workshop. The workshop welcomes anyone who works with the skeletal remains of past populations, although it would be particularly suitable for researchers and students involved in biological anthropology or osteoarchaeology. Enthesophytes, also known as musculoskeletal markers (often abbreviated to MSM), are observable indicators of activity-induced stress on bone, often appearing as bony projections. They are present on the origin and insertion of muscle on bone in the form of the ossification of the tendon and ligament attachments that help anchor the body of a muscle to the bone itself. They are often the product of repetitive movements or of a demanding physical lifestyle and, when scored and recorded at a population level with the correct controls in place, can be used to infer as Markers of Occupational Stress (MOS). This is partly why it is important to become familiar with musculoskeletal anatomy as a human osteologist because the two systems are so entwined in their action. It should be mentioned here that enthesopathies are distinct from osteophyte formation on, or around, the joints (and not at muscle origins or insertions) which also look like bony projections. There can also be a presumption in the palaeopathological literature to use the evidence of osteoarthritis alone in skeletal remains as an indicator of a physically demanding lifestyle; this should only be considered when used in conjunction with the observation and the recording of differences in the size of the left and right-side bones, size and location of any enthesophytes present, other pathological lesions, and certain non-metric traits in the individual (Roberts & Connell 2004: 38). Although well-studied within the osteoarchaeological literature, there are still gaps in the knowledge of the cause of enthesopathies. Further to this is the fact that rarely are musculoskeletal markers recorded in detail during the initial osteological analysis of archaeological remains. There is also, for instance, ongoing debate regarding the action of disease processes in the forming, or influencing, of both fibrous entheses and fibrocartilaginous entheses, as well as the difference in left and right side prevalence, and the effect of life course changes on enthesophytes (Hawkey 1998, Villotte & Knüsel 2013). However, there has been a deepening of the understanding of the cause, development and implication of enthesophytes in the human body in the recent osteoarchaeological literature (Villotte et al. 2010). Particularly regarding the likely multi-factorial influence in the aetiology, or cause, of these physical alterations (Villotte & Knüsel 2013). New technology, such as 3D photogrammetry, is also helping to produce large databases of comparative material, as well as clearer macro and micro visual images of the anatomical changes present in enthesophytes. The data scored and documented on individuals can, when analysed at the population level, lead to observations on the physical repetitive movements needed to produce the musculoskeletal markers. The Coimbra method has started to become a standard within the recording of enthesophytes, although I personally will have to wait until the workshop to learn about this in detail. Interpretations can thus be made, and hypotheses tested, on the ability in identifying past-activity patterns of archaeological populations. They can also be used to hypothesize the actual range of active movement during the life of an individual. Hawkey (1998), for instance, has demonstrated the ability to reproduce possible movement patterns available to a severely disabled individual in a Pre-Colombian context in New Mexico. Hawkey & Merbs (2005) later used MSM’s to highlight subsistence change within the Hudson Bay Eskimos, noting that different activities could be differentiated via the skeletal anatomy and related changes to stress. Although this entry is possible a tad late, I will be attending the 1 day long course and will endeavor to produce a blog entry detailing what I learnt during the workshop itself. As always with this blog, if you or your department are hosting a workshop or a short course in human osteology, biological anthropology or osteoarchaeology, and want to let others know about it, then please feel free to contact me and I’ll help spread the word. Details of the 1 day long Coimbra method workshop at the University of Sheffield can be found here. The university has a well-developed osteology laboratory and Masters program at the Department of Archaeology – you can learn more about the osteoarchaeological research carried out at the University of Sheffield here. The University of Coimbra’s Department of Anthropology hosted an international workshop back in July 2009, titled Musculoskeletal Stress Markers (MSM): Limitations and Achievements in the Reconstruction of Past Activity Patterns, that has proved instrumental in rejuvenating the scientific study of MSM’s. A full workshop abstract booklet can be found here and Prof. Charlotte Robert’s thought-provoking perspective on 25 years worth of study on MSM’s can be found here. If you have either academic access or subscribe to the International Journal of Osteoarchaeology journal, it helpfully released a special edition in 2013 (Vol 23 (3): 127-251) titled Entheseal Changes and Occupation: Technical and Theoretical Advances and their Applications, which details and summaries the importance of the many recent approaches to MSM’s and OSM’s. Read it here. Hawkey, D. E. 1998. Disability, Compassion and the Skeletal Record: using Musculoskeletal Stress Markers (MSM) to Construct an Osteobiography from Early New Mexico. International Journal of Osteoarchaeology. 8 (5): 326-340. Hawkey, D. E. & Merbs, C. F. 2005. Activity-induced Musculoskeletal Stress markers (MSM) and Subsistence Strategy Changes among Ancient Hudson Bay Eskimos. International Journal of Osteoarchaeology. 5 (4): 324-338. Roberts, C. & Connell, B. 2004. Guidance on Recording Palaeopathology. In: Brickley, M & McKinley, J. I. (eds.). Guidelines to the Standards for Recording Human Remains. IFA Paper No. 7. IFA & BABAO. pp 34-39. (Open Access). Villotte, S., Castex, D., Couallier, V., Dutour, O., Knüsel, C. J. & Henry-Gambier, D. 2010. Enthesopathies as Occupational Stress Markers: Evidence from the Upper Limb. American Journal of Physical Anthropology. 142 (2): 224-234. Villote, S. & Knüsel, C. J. 2013. Understanding Entheseal Changes: Definition and Life Course Changes. International Journal of Osteoarchaeology. 23 (2): 135-146.